OK so I haven't written anything for a few weeks, but I have been kind of busy. 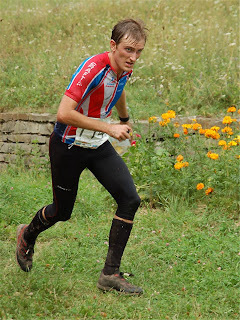 I spent a few days in Czech Republic training for WOC next year, then I went to run the Austrian relay and long champs, and then I moved to Stockholm. At the weekend I also went to the SM middle and relays in Halmstads. This was a training cam with the GB team, but it was a very young group of athletes in general, with 7 athletes and 3 staff. We did a lot of training, ran up a lot of big hills and in general I did a bit much. At the end of the few days in Olomoutc, we drove down to Vienna to take part in the Austrian champs. Saturday was the relay, and we had 2 even teams entered with 2 athletes and a coach in each (for a bit of fun). I ran 1st leg and felt surprisingly good considering all the training we did in Czech, and I came back first, just in front of Matthias Muller, which was nice. I did feel a bit of a strain in my right quad though, which meant I didnt run the long, and had a few days off running when I got back. After 2 legs, the two GB teams were 1st and 2nd with a fair lead, and then the coaches ran to form and dropped us to 2nd and 5th (?). We didn't really have time to run the long anyway, as we had to drive back to Brno to catch our flight. On wednesday I moved to Stockholm! On Thursday I left Stockholm to go to Halmstads for the SM middle and relay. I wasn't allowed to run the middle as apparently I am not good enough. I ran round after everyone else had finished and my time would have put me 17th=, about 3 minutes behind Wingstedt. Public results here, SM results here. 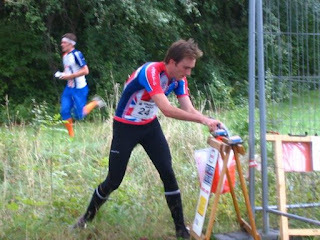 I was allowed to run the relay though, and with Petter Haraldsson, Casper Giding and Emil Lauri IFK Lidingö finished 8th. I ran 3rd leg, and when I came in we were in 3rd place, within reach of 2nd, but Emil had a bad day and dropped a bit on last. 8th is still a damn good result though, and only 3 minutes from a medal after 4 x 70 minute legs isn't bad. Results here. Back in Stockholm again now, and this week it is Lidingöloppet, which is 'the world's largest cross-country race'. The men's is 30km, women's 15km, and my club organise it, so all week we will be helping set up. I have started putting my training on Attackpoint again, so if anyone is interested in seeing what training I do, you can see here.